As the 14 Democrats looked on helplessly from Illinois, unsure of where to turn next, something miraculous happened. Trained through years of successful coalition building, bred to serve community and family, highly educated with a rich tradition of peace, justice and workers’ rights, the citizens of the state of Wisconsin collectively stood up. Like Donald Driver grabbing an Aaron Rodgers’ Hail Mary, We the People took the ball and ran like the wind. Together we set up shop to protect our state. Without really knowing what we were doing, Wisconsin took a mighty shake and began a movement that was desperately needed and long overdue: to wake the hell up. As the people in the capitol dug in for an occupation, all over the state, intuitively, people started showing up—to protest, to file law suits, to testify, to make phone calls, to do nonviolence training, to drum, to organize recalls, to write editorials, to educate our neighbors, to sing, to live stream what was happening—to protect Wisconsin from the takeover. Every bar and coffee shop across the state came alive with people becoming educated, engaged, and aware of what was happening around them. Before this, I had mildly paid attention to politics, but now I couldn’t tear myself away. I discovered Wisconsin Eye (wiseye.org), the service that broadcasts and records all legislative sessions. I listened nonstop to sessions and committee meetings. Glued to my computer when I was not in Madison, I turned to Facebook to watch the videos being broadcast daily. Some guy named Segway Jeremy Ryan was live streaming from inside the capitol. While corporate media was doing Walker’s bidding, referring to protesters as “union thugs” and “out-of-state agitators,” citizen journalists were at work day and night to cover the real stories. As the days wore on, hundreds of thousands of people descended on the capitol in a show of support. The Madison police came out early to stand with the people, even though Walker claimed their union would be exempt from the bust (which later proved to be another lie). They made the choice not to become “palace guards” for the takeover. During the day, many worked their shifts, and then went home to change and come right back to protest as private citizens. The day before Walker illegally closed the capitol, the police slept over with the rest of protesters. As a peace activist, this display from my home state was positively breathtaking. Everyone who showed up was committed nonviolence. This is a peaceful protest, was the mantra. Those words, posted on the backs of signs, were a constant reminder as we marched. If someone escalated, someone in the crowd kindly reminded them of their commitment to peace, which instantly defused them. The crowd became self-monitoring, but in truth, there wasn’t much to monitor. Protests were more like community celebrations where we made new friends and connected our grassroots together to draw power in our continuing stand for our rights. 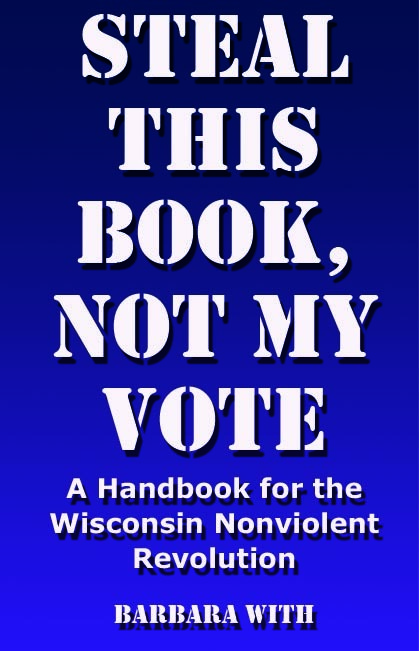 I asked around, “Who told everyone to do this?” Seems our long-established Wisconsin Network of Peace & Justice sent in trainers to teach nonviolence. It worked. Throughout the long weeks of gathering crowds at the capitol that winter, there was little if any crime. Not one incident of theft was reported from the hundreds of thousands of people who moved in and around the capitol. One weekend someone trumped up some charges—a “bomb threat at the airport”—which turned up nothing but a mug shot of a guy who was “released and no bomb was found.” Try as the Republicans would to spin this as violent, we remained peaceful. Neighbors from all over the state were meeting in the protest lines and becoming part of a movement that, once it got flowing, simply could not be contained. On February 25, the Assembly moved the repair bill through a grueling 62-hour debate. At the last minute, Speaker Pro-tem Rep. Kramer (R-ALEC) called for the roll without warning, leaving representatives on both sides of the aisle unable to cast their vote. The Republicans didn’t care: with an almost two-to-one majority, they could risk losing a few of their members’ votes to make sure this bill moved forward. Chaos erupted on the floor as Assembly Dems joined the ever-loudening chants of “shame” coming from the thousands of protesters in the gallery and occupying the capitol. Rallies continued. Ordinary Wisconsin-loving people—teachers, fire fighters, corrections officers, small business owners, students, grandmothers, dogs, scientists, professors, retirees, lawyers, consultants, bartenders—marched day after day through the cold to protest this takeover. Those camped out in the capitol created an entire community inside, complete with a food area, childcare, donations table, battery recharge stations, and media center. One concerned mother ordered pizza to be delivered to the capitol from a local pizzeria. Soon Ian’s, a landmark on Madison’s State Street, was getting calls from all over the world with donations for pizzas. Fire fighter, police, electrical and construction unions all took shifts to keep the occupation alive. Over time, police convinced most of the protesters to leave the capitol peacefully. Once they were out, however, up went metal detectors and access into the capitol was shut down. Democrats were illegally searched and forced to show their capitol ID. Former Congressman Obey (D) was completely denied entry to attend a meeting. Rep. Milroy (D-Spooner) was wrestled to the floor as he tried to get to his office. After that, Fred Clark (D-Baraboo) and other Dems brought their desks out onto the lawn to reach their constituents, who were also being denied access. Meanwhile, in Illinois, Republicans claimed that the Dems were not willing to negotiate, while Dems said they were already negotiating the terms of their return when Republican Senators decided to pass a resolution that the Dems were in contempt and ordered their arrest. Unfortunately for the Republicans, they had no authority to arrest the Dems, who had committed no crime and who claimed to be in negotiations up until they were ordered arrested. The truth was, with the Dems gone, the Senate simply didn’t have quorum and Republicans couldn’t pass the bill. So after weeks of claiming that unions were the cause of the budget shortfall, Republicans drafted Act 10, separating out collective bargaining from the fiscal portions of the repair bill. This put union busting into its own category wherein they would not need quorum, as it was now not a budget item. The rest of us, however, understood that when Walker busted the unions, he was undermining the support of the Democrat party. This move supported the takeover in eliminating a multiple party system for Rove’s desired, “Permanent Republican Majority.” Destroying the rights of the people to work collectively, fascism could take one more power grab by destroying the right to one person, one vote. Who needs votes in a one-party system? The first major move to reveal their real motives came on the night of March 9. In violation of Wisconsin open meeting law, and in abuse of public trust, Republicans pulled Act 10 into committee at the last minute. Word spread instantly and 5,000 people showed up at the capitol, breaking through Walker’s illegal barricades to catch the thieves red-handed. Minority House Speaker Rep. Peter Barca (D-Kenosha) faced down Fitzgerald, calling out the violation of law, to no avail. In front of the citizens, with Wiseye and all the major new stations broadcasting the steal, Republican took control. Fitzgerald called the roll through Barca’s insistence that they were breaking the law, and gaveled the meeting closed while thousands of protesters chanted, “Shame.” Republicans now officially outed as fascists quickly left the hearing room as the entire sordid affair was captured on tape as evidence. All the while, the rest of the country had no idea that Walker and the fascists had taken over the capitol like this. The truth of what was happening in Wisconsin was under a national media blackout. The mainstream press was painting the people standing up against fascism with a two-word fraudulent brushstroke: “union thugs.” To distract from their own illegal actions, the Fascists struck again and again with lies and propaganda, crying “thugs” all the while they themselves were passing bills that removed our rights and made off with all our assets. Corporate media piped through the mainstream that Walker was “presidential stuff,” while in reality, from Wall Street to the Fed, we were being robbed, and here it was happening again right before our eyes in our own Wisconsin. After Act 10 “passed” in the middle of the night, the Dems decided to come home. The day they arrived at the capitol, farmers from all around the state drove their tractors to the square and hundreds of thousands of people greeted them as heroes. Indeed, it was their action to leave the state that revealed the true intention behind this ALEC bill and allowed the citizens to take action. However, Scott Fitzgerald continued with his unauthorized power grab by declaring that the Democrats would no longer be allowed to vote in committee meetings. On March 18, Dane County Judge Marianne Sumi issued a retraining order to prevent the Republicans from publishing Act 10. In her ruling, she recognized that Wisconsin open meeting laws had been broken when they did not provide 24 hours notice for the late-night session. Even emergency sessions required at least two hours notice, which also was not given. After ignoring two previous restraining orders to open the capitol issued on February 27 and March 2, Walker declared that they would ignore this order, too, and that their bill was going to be law, no matter what the court was ordering them to do. Walker ordered Secretary of State Doug LaFollette to publish the bill immediately; he refused. Walker then when to the Legislative Reference Bureau, the department responsible for drafting bills—and had them publish it on their website. This action did not enact the bill; that would only happen when it was published in the state newsletter. However, before it had a chance to become law, two unions files a case against Act 10 as illegal. Now it and the Republicans were headed to court. As we were headed to court, protests refocused from the streets to Wiseye and social media. Everyone went back to work but kept a close ear and eye to the ground. Average citizens just didn’t have the time to take away from their jobs and families to monitor the capitol. But citizen journalists sprung from those camped out through the occupation, reporting the news in blogs and video while it was happening. After the crowds went back to work, many of those journalists stayed and dedicated their lives to be unpaid reporters. Without this new breed of reporting, Wisconsin would have been lost early on. In a show of ongoing, peaceful solidarity, however, a group of citizens began meeting every day at the capitol to raise their voices in song as a form of protest. On March 11, 2011, the first official Solidarity Sing Along was held. Protest songs were printed in books and given out to whoever showed up each day to sing. The Sing Along served to maintain a continuous presence at the Capitol, as well as providing a place where citizens could come together and rejuvenate their spirits through song as they continued the stand against Walker and the Fascists. Looking forward, however, we had not only had recalls and the court case to look to, but the Supreme Court race was April 5. Anything could happen. Outraged at the abuse of power, citizens of the state rose up to organize recalls of Walker and all the eligible legislators. While Walker’s couldn’t begin until November, eight Republicans and eight Democrats were immediately eligible; six Republicans and three Democrats ended up being challenged. In an unprecedented movement to gather signatures, citizens all across the state spent months knocking on doors, standing on street corners, collecting signatures from friends and family, all in an effort to remove the traitors who were selling out our state and abusing their power. It was soon clear that public sentiment was organically driving the recall campaigns. No union could have paid this many people to work so passionately to participate in due process. I believe by the time the recalls were being organized, we as a state were beginning to see the long road ahead. No matter how fast we worked, those engaged in the takeover had now proven they would break the law to move their agenda through at lightening speed. At the same time, they were breaking the public trust by suppressing dissent, ignoring the voice of the people and locking Democrats out of the process. But apparently, they underestimated the good citizens of the state and our intention to stand strong against the injustice of their actions. The entire illegal operation to pass the Act 10 in secret finally came before Judge Sumi in Dane County. After several days of testimony, it became evident and was eventually declared that Scott Fitzgerald and the Republicans did indeed violate the open meeting law. Later the Republican spin would become that the law did not apply to the legislators, as they had the power to override the open meeting laws. What the spin left out was that this was covered in the trial, too. Turned out even overriding the open meeting law had rules and regulations to follow, which the Republicans did not. I listened to the trial on the Internet live during a tour through Romania that March. I heard for myself the moment Fitzgerald’s lawyer, who had been sweating bullets on the stand, had to admit, finally, yes, they broke the law. And yet all we heard in the news was, How dare the judicial branch think it can rule over the legislative branch, as Fitzgerald’s spin went while yet another blatant criminal act only reminded us that we knew full well the need for checks and balances. This was Civics 101 and yet the corporate media persistently continued to run Fitzgerald’s sound bytes over and over. The Republicans however, learned from this mistake. Later, when they called their “Extraordinary Sessions” to fast track every ALEC-inspired bill through both chambers before the session ended—openly abusing their power of office to enact legislation that directly opposed the US Constitution—they made sure to follow the special meetings rules. In fact, every session in the year ahead would turn out to be a “special” one, allowing for ongoing rapid-fire of legislation through the system at record speed, without input from the Democrats or the people. Appeals were immediately filed against Judge Sumi’s ruling and now the case had nowhere to go but to the Supreme Court. Only trouble was, the upcoming Supreme Court election on April 5 had Republican incumbent Justice David Prosser facing off against Joanne Kloppenburg, assistant attorney general whose name was rising in the polls as more citizens discovered what Walker was doing. Bringing Act 10 before Prosser’s Supreme Court was vital for the Fascists to move the takeover out of the gridlock and get it back on track. But thanks to Kathy Nickolaus’ bad math, the entire State was about to discover just how corrupt Wisconsin election systems have become over the years. Is someone screwing with you? If I were a Fascist I’d try to mess you.